Zionism Unveiled: Who Are Today's Jews? This is a question that necessitates a clearly-explained and well-defined answer. 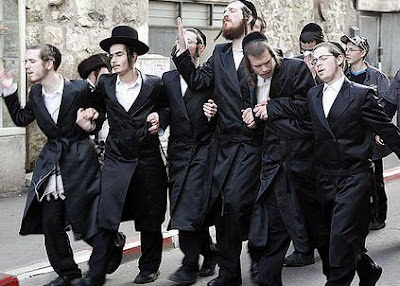 The bulk of American Jews (roughly 90%) are known as "Ashkenazim." The singular being "Ashkenazi". The Ashkenazim are descendants of Germans. The ancestor is even recorded in the Bible, "Ashkenaz." (1 Chr. 1:6) Ashkenaz is the grandson of Japheth, Gomer being his father. Japheth according to the Table of Nations (Gen. 10:2-5 ff. 1 Chr. 1: 5&6) is the father of the so-called "Euro-Asiatic" people groups, of which the so-called "White race" is apart. The Ashkenazim are indeed "Japhethites" and not "Semites" as they falsely proclaim. It is interesting to note that they are considered the "new Jews" by their their Sephardi counterparts. The other brand of Jews that are not so known are the "Sephardim." The Sephardim trace their ancestry to the Spanish and Portuguese Jews. It was the Sephardim that financed Columbus' voyages to the Americas. The Sephardim can also trace their ancestry to Sepharad. Sepharad is also recorded in the Bible. (Obadiah 1:20) "Sepharad" is a Biblical placename of uncertain location. Insterestingly enough however, Sepharad is the modern Hebrew word for "Spain." With that said, according to the research of Stephen Birmingham, "The Sephardim pointed out that that the Ashkenazim used a different ritual (prayers, music, etc.) and they did-somewhat. The pronunciation of Hebrew was slightly different. The Sephardim spoke with a Mediterranean inflection, the accent often falling on the last syllable. (The Sephardim say Yom Kippur, not Yom Kippur, as the Ashkenazim do.)" To expound further on the linguistic differences between the Ashkenazim and the Sehardim, the Ashkenazim spoke the more harsher sounding German and the concocted mix of German and Hebrew called Yiddish, whereas the Sephardim spoke the more "musical, lyrical" Spanish as Birmingham records. Regarding the phenotypical features of the Ashkenazim and Sephardim, Birmingham records, "...(the) German Jews had large, awkward looking noses, and lacked the the elegant refinement of the highly-bred, heart-shaped, olive-skinned Spanish face." Undoubtedly they inherited that "olive-skinned Spanish face" from the Black African Moors who occupied Spain for 400 years. It was the Black Moors who brought culture and refinement to Spanish society and they spawned the Enlightenment era of all of Europe. This latter conclusion did not come from Birmingham but from another independent study. I will be posting a blog on the African origins of modern Judaism very soon. Rachel Corrie: Is There Not a Cause?!?! The Historical Origins of the Word "Jew"